includes one War Dog Team and one medium base. The US Marine Corps war dogs in the Pacific Theatre of operations excelled at detecting Japanese ambushes, helping to save the lives out countless Marines. The Marine War Dog Platoon is available to Marine Rifle Company as a reconnaissance option, in which case it must make Combat Attachments to Marine Rifle Platoons or Scout & Observer Platoons with all of its War Dog Squads. The US Marine Corps used war dogs in the Pacific theatre where they excelled as messengers and at alerting troops to Japanese ambushes. A dog and its handler were often attached to reconnaissance patrols where the dog’s keen sense of hearing and powerful nose would detect trouble well ahead of their human companions. 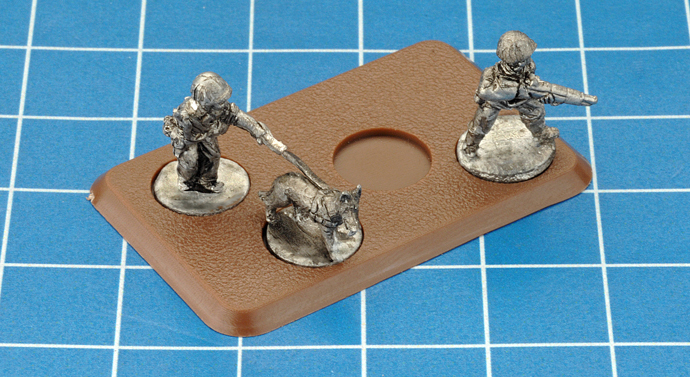 Teams placed from Ambush must be more than 10”/25cm from all Dog Handler teams (instead of the normal 8”/20cm for Recce teams, see page 193 of the rulebook). The Dog Handler teams do not have to be in Line of Sight. a. x1 Standing Rifleman. b. x1 Standing Dog Handler. c. x1 War Dog. d. x1 Medium Base. Step 1. 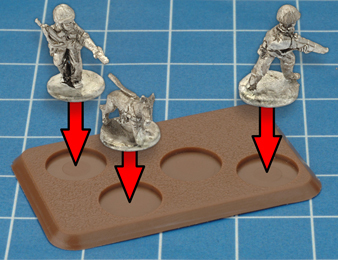 To assemble your War Dog Team arrange your miniatures as seen below. Note. Make sure the War Dog's leash is aligned correctly before glueing. You may need to shorten the leash to achieve an exact fit.